My thanks to Harper Collins and Edelweiss for providing me with a digital review copy. No compensation was provided for this review, and all opinions are my own. 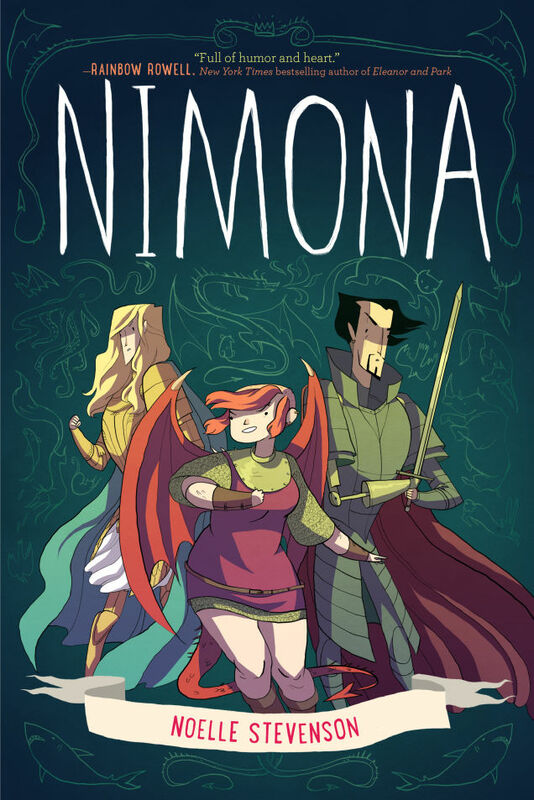 If you’re big into webcomics, you’ve probably heard of NIMONA. Noelle Stevenson’s witty, off-beat and somewhat dark webcomic quickly developed a cult following, catching the attention of major publishing houses. Thus, the graphic novel version of NIMONA was born. As usual, I was very behind the times and hadn’t heard anything about NIMONA until galley copies started floating around. But now that I’ve read it, I can honestly say that it’s the best graphic novel I’ve read all year. Ballister Blackheart is one of the most infamous villains of his day – but that wasn’t always the case. Once, he was a bright-eyed hero in training, poised on the cusp of greatness. But then he was betrayed by the person closest to him: Goldenloin. Take a moment to let that name sink in. Weirdly enough, Blackheart and Goldenloin are still pretty chummy. Goldenloin may be a bit of a tool, but he’s the coolest guy around compared to the Institution of Law Enforcement and Heroics. Blackheart is convinced that the Institution is up to no good, experimenting with forces beyond their understanding in an attempt to seize power. Is it possible that Blackheart the villain is actually Blackheart…the hero? Well if so, that will come as quite the disappointment to his new apprentice Nimona, a young and bloodthirsty shape-shifter bent on becoming the biggest and baddest supervillain around. Of course, there’s more to her than just that. Girl’s got a killer (GET IT?) sense of humour. Not surprising, since one of her forms is a FIRE BREATHING DRAGON! As you can see in the panel below, Nimona has some draconic tendencies…like a burning desire to smite her enemies. Blackheart’s not wrong: despite her determination to kill Goldenloin (the guy has a weird appeal, even with the name) Nimona really does grow on you! By turns bubbly and surly, violent and protective, Nimona is a truly unique character with a mind-blowing back-story. Nimona is a scamp and I loved her. She often uses her shape-shifting abilities to pull pranks on Blackheart, scaring the ever-loving daylights out of him. But Nimona isn’t all sweetness and light: she also uses her gifts to execute insane, violent escapades that generally wreak complete and utter havoc and sometimes result in death. Why does she do these things? Do her actions make her a monster? Noelle Stevenson is a clever writer and talented artist with a knack for representing typically under-represented characters in graphic novels. With a punky protagonist on the heavier side and a LGBT romance, Stevenson injects some realism (aka diversity) into NIMONA without tokenizing anyone. NIMONA poses some pretty powerful questions. Who decides what – or who – a monster is? How are monsters made by society? What makes a hero? And most importantly, can monsters be redeemed…even if they don’t believe it’s possible themselves? Noelle Stevenson encourages her readers to mull over these tough questions without ever taking herself or her work too seriously; she seems to effortlessly achieve the perfect balance between some “big questions” about morality and hilarious running gags about sharks. And beards. I laughed, I cried, I squeed with complete and utter abandon. If you only read one graphic novel this year, make it Noelle Stevenson’s NIMONA. Ugh it is SO GREAT, Tammy. Dragons, violence, humour, diversity…what’s not to love? 🙂 Looking forward to hearing your thoughts on this one! I remember your WoW for this, actually! And my mistake for thinking the girl is a half-devil instead of a dragon, haha. Sounds wonderful and I love the clean art style. Going to add it to my list to watch, for the next time I go on a graphic novel binge. You know, it’s funny you mentioned that WoW post because I’ve been thinking of taking a page out of Tammy’s book and writing a post on how many of my WoW picks I’ve actually read or have purchased. I’m really glad I went ahead with NIMONA because it’s sooo great! I love that it’s one contained story, too.